This picture was provided by farmer's wife Mary Henry, whose son Alistair is pictured. He has given names for the pupils here. Back row (from left): Robin Campbell, Alan McLure, Stewart Smith, Tom Cuthill, Stuart Alexander, Alistair Henry, boy McClure, Sandy Campbell. Front: Avril Cowan Ann Parker, Gwen Eaglesham, Angela Agnew, Jan Gibson, Josephine Davidson, Hilary Adams. From article in the Ayrshire Post 12th April 2002. 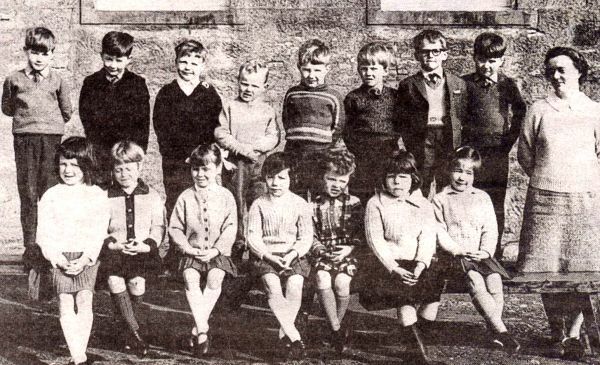 Kirkoswald Primary School class from 1966, with teacher Miss Kathleen Byers. And it's something of a collector's piece - for the school closed in 1988. The pupils will now be in their early 40s, and hopefully won't mind being branded `history'! In their day, the school had a healthy roll of more than 50 pupils. But that had plummeted to just nine in June, 1988, when the school bell sounded for the last time. Tom Petticrew, who lives in retirement in Alloway, was headmaster from 1969 till the school closed. And he taught these pupils when they reached the P6 and 7 class. 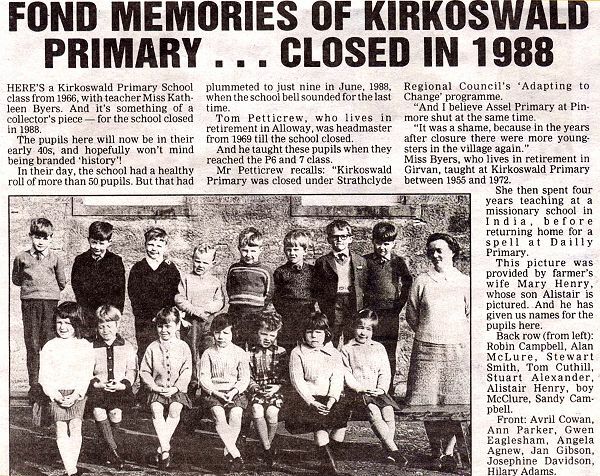 Mr Petticrew recalls: "Kirkoswald Primary was closed under Strathclyde Regional Council's `Adapting to Change' programme. "And I believe Assel Primary at Pinmore shut at the same time. "It was a shame, because in the years after closure there were more youngsters in the village again." Miss Byers, who lives in retirement in Girvan, taught at Kirkoswald Primary between 1955 and 1972. She then spent four years teaching at a missionary school in India, before returning home for a spell at Dailly Primary. From article in the Ayrshire Post 12th April 2002.